↑ Martin, R. Aidan. "Teeth of the Skin". 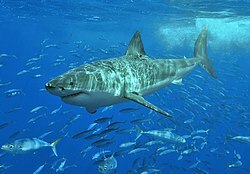 http://www.elasmo-research.org/education/white_shark/teeth.htm. Retrieved on 2007-08-28. ↑ Martin, R. Aidan. "Skeleton in the Corset". ReefQuest Centre for Shark Research. http://www.elasmo-research.org/education/white_shark/skeleton.htm. Retrieved on 2009-08-21. ↑ "A Shark's Skeleton & Organs". http://web.archive.org/web/20100805003021/http://langonigraphix.com/skeleton.html. Retrieved on August 14, 2009. ↑ "Compagno's FAO Species List - 1984". Elasmo.com. http://www.elasmo.com/frameMe.html?file=selachin/fao/shark_gn.html&menu=bin/menu_topics-alt.html. Retrieved on 2009-09-14.